Here are some other things I found while cleaning out my desk. 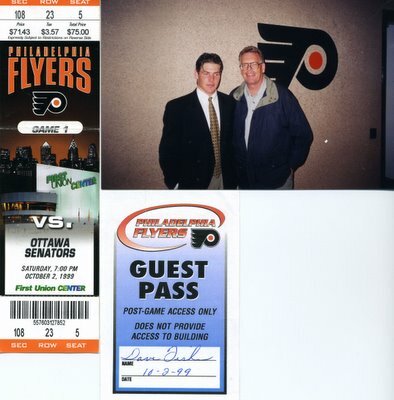 One of the most exciting sports events of my life was attending my nephew Mike Fisher's NHL debut in Philadelphia on October 2nd, 1999. Roger Neilson, the Flyers' coach at the time, arranged for tickets. I wanted this to be a surprise for Mike and he didn't know I was there until he came out of the dressing room following the game. This picture was taken that night. Now Mike has 5 seasons under his belt and had a great game tonight with a goal and two assists against the Carolina Hurricanes. You've come a long way, Little Fish!